New Version of WPS for Ubuntu Kylin Released! Kingsoft rencently released new version of WPS for Ubuntu Kylin（version: 10.1.0.6634）. This version provides latest features of user account system and cloud office, which will help you to process and synchrize documents on different platforms and terminals. It also includes all updates and improvements since last release. We believe this new version will bring the best office experience to our users. 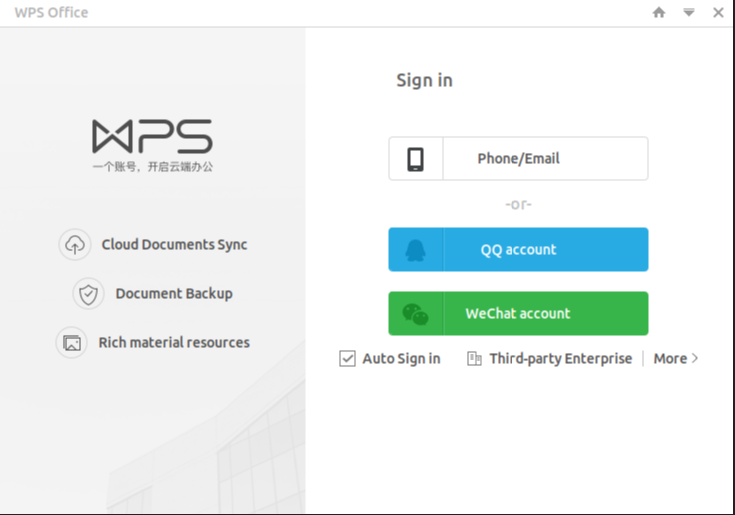 WPS Office Software, a leading office productivity suite for PC and mobile devices. WPS Office for Linux brings the world’s best office experience to the Linux community, offering complete compatibility with Microsoft Office document formats, including PPT, DOC, DOCX, XLS, and XLSX. You can get more info from https://www.wps.com/linux. Ubuntu Kylin is an open source operating system dominated by CCN open source joint laboratory and Tianjin Kylin Ltd. CCN were created by CSIP, Canonical and NUDT in 2013 who is aimed to promote open source development, innovation and popularization. Ubuntu Kylin was born to be an offical flavor of Ubuntu. It aims to provide an user-friendly, powerful and stable experence for world wide Linux users. It ships an Windows-like desktop environment called UKUI and dozens of practical and excellent applications developed by Ubuntu Kylin team or cooperated with software manufacturers.Besides CCN lab, its developers also come from Debian, Ubuntu, Mate, LUPA, etc. There have been 11 released versions since 13.04 which includes 3 LTS versions ( 14.04,16.04,18.04 ). Previous：The 8th NUDT Kylin Software Development Content Comes to a Successful End! Next：Ubuntu Kylin 18.04 LTS Now Available for Download!